A procedure to optimise the stacking sequence of a composite fan blade-like structure is proposed in this article. 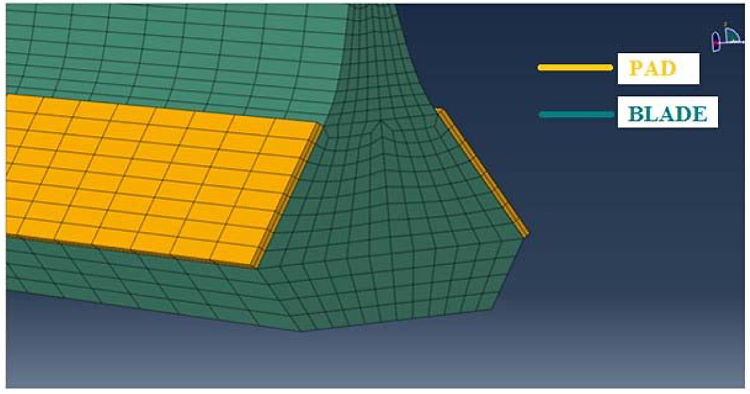 The aim of the optimisation is to minimise weight when respecting deformation, frequency and strain constraints. 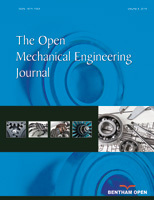 The literature often deals with stacking sequence optimisation of airplane wings or wind turbine blades whilst less attention has been dedicated to aero-engines fan blades, the objective of the present paper. The manufacturing constraints are also implemented in the optimisation process in order to obtain a manufacturable structure. Stacking sequence of composite laminates can be tailored to drive the deformation towards the desired shape (potentially exploiting unbalanced laminates and their anisotropy). When optimising the stacking sequence (including blending/tapering) of an aero-engine fan blade-like structure, manufacturing constraints must be included in order to apply the results of the optimisation procedure into a “Real World” design. To define an engineering procedure able to provide a good design point to minimise the weight of a fan blade-like structure subjected to deformation (tip extension and untwist), frequency and strain constraints. A two-level optimisation procedure is proposed. 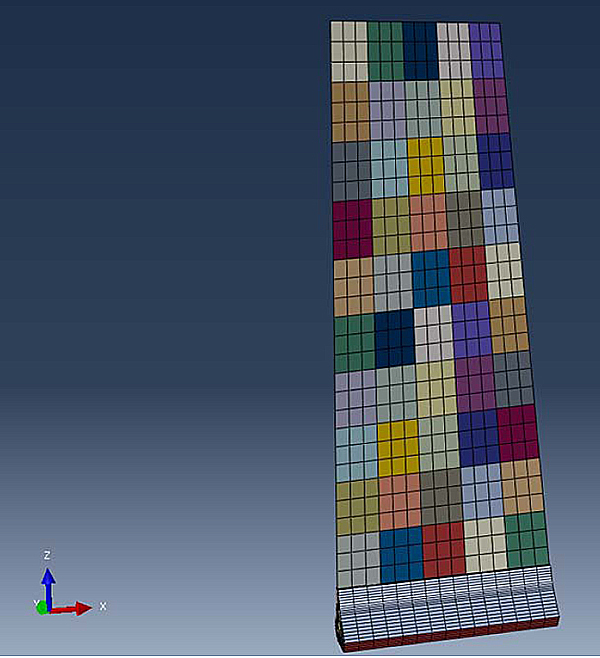 At the first level, the stacking sequence is optimised in such a way to maximise stiffness (and therefore to minimise deformation). Less stringent limits are applied to the constraints of such a level 1 optimisation. In the second step of the optimisation, the blending/tapering of each ply of the stacking sequence is searched. The fan blade-like structure is loaded only with a centrifugal load (the main load acting on this kind of components). The stacking sequence obtained to minimise the weight contains 42.3% of 0 degrees fibres, 19.25% of 45 degrees fibres, 19.25% of -45 degrees fibres and 19.2% of 90 degrees fibres. 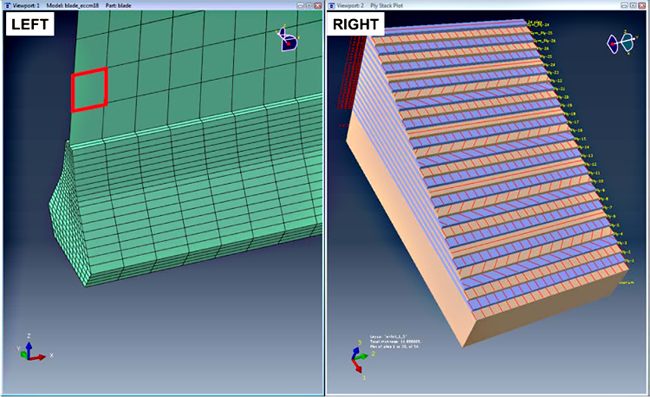 Blending in terms of width and length of each layer is given in the numerical results section. When the fan blade-like structure is loaded with a centrifugal force only, in order to minimise weight by respecting untwist, tip extension, frequency and integrity constraints, no unbalance in the laminate has been found necessary. An “Optimum” point has been found after a two steps optimisation. This design point is claimed as a good industrial design point rather than as “optimum” in the mathematical sense. Such a “Best Solution” design point has been verified by exploring the design space near it. All the performance of the neighbour points has been found worse. A comparison between a quasi-isotropic laminate and a zero degreed dominated laminate has been also performed. Keywords: Composite optimisation, Blending, Stacking sequence, Untwist, Elastic tailoring, Fan blade. © 2018 Canale et al. open-access license: This is an open access article distributed under the terms of the Creative Commons Attribution 4.0 International Public License (CC-BY 4.0), a copy of which is available at: (https://creativecommons.org/licenses/by/4.0/legalcode). This license permits unrestricted use, distribution, and reproduction in any medium, provided the original author and source are credited. In the last twenty years, composite materials have been widely used in the design and manufacturing of structural components. This trend is particularly relevant in industries such as automotive, marine or aerospace. The excellent strength/weight ratio of composite materials together with their resistance to fatigue and to corrosion makes them attractive for lightweight structures [1M.J. Robert, Mechanics of Composite Materials, 2nd revise.Taylor & Francis Inc: Washington, United States, .2nd revise. ], even if challenges such as damage caused by impact loading [2S. Abrate, Impact on Composite Structures., Revised ed.Cambridge university press: Cambridge, United Kingdom, .Revised ed.] and degradation due to environmental effects still remain [3M. Meng, H. Le, S. Grove, and M. Jahir Rizvi, "Moisture effects on the bending fatigue of laminated composites", Compos. Struct., vol. 154, pp. 49-60. [http://dx.doi.org/10.1016/j.compstruct.2016.06.078] ]. One of the main advantages of composite materials is that their stacking sequence (with the potential resulting anisotropy) and ply terminations can be exploited to tailor the structural stiffness in such a way to optimise a particular structural performance. This has been suggested for many years in the design of airplane wings or fuselages, both at the sub-system level with disciplines such as aeroelastic tailoring [4"T. J. HERTZ, and T. A. WEISSHAAR, “Aeroelastic tailoring - Theory, practice, and promise", J. Aircr., vol. 23, no. 1, pp. 6-18. [http://dx.doi.org/10.2514/3.45260] , 5N.P.M. Werter, and R. De Breuker, "A novel dynamic aeroelastic framework for aeroelastic tailoring and structural optimisation", Compos. Struct., vol. 158, pp. 369-386. [http://dx.doi.org/10.1016/j.compstruct.2016.09.044] ], and at the single component level, where the structure has been optimised for a given set of loads [6J.E. Herencia, P.M. Weaver, and M.I. Friswell, "Optimisation of long anisotropic laminated fiber composite panels with T-Shaped stiffeners", AIAA J., vol. 45, no. 10, pp. 2497-2509. [http://dx.doi.org/10.2514/1.26321] -10F. Javidrad, M. Nazari, and H.R. Javidrad, "Optimum stacking sequence design of laminates using hybrid PSO-SA method", Compos. Struct., vol. 185, pp. 607-618. [http://dx.doi.org/10.1016/j.compstruct.2017.11.074] ]. These optimisation efforts have been recently extended to the design of a critical component such as a composite fan blade [11M. Thomas, P.M. Weaver, and S. Hallett, "Variable stiffness composite laminates for rotating pre-twisted plates", the 17th European Conference on Composite Materials, ECCM, 17th, ., 12R.M. Coroneos, "Structural analysis and optimisation of a composite fan blade for future aircraft engine - NASA/TM—2012-217632", Glenn Research Center, Cleveland, Ohio, 2012.]. A procedure to minimise the weight of an aero-engine fan blade-like structure, subjected to a centrifugal force is proposed here. Constraints of the optimisation are thresholds on the deformation (aerofoil untwist and tip extension) and natural frequency bands (for the first and second natural modes). Minimum strain thresholds for structural integrity must also be respected. A two-level optimisation has been conceived in order to produce a realistic stacking sequence, respecting manufacturing constraints [13T. Macquart, M.T. Bordogna, P. Lancelot, and R. De Breuker, "Derivation and application of blending constraints in lamination parameter space for composite optimisation", Compos. Struct., vol. 135, pp. 224-235. [http://dx.doi.org/10.1016/j.compstruct.2015.09.016] ]. The results of this dual step optimisation are presented in this paper. It is very important to remark that the aim of the present work is not to provide a rigorous procedure to find a mathematical “Optimum” but, more in general, to propose a good and practical design solution able to satisfy manufacturing constraints. 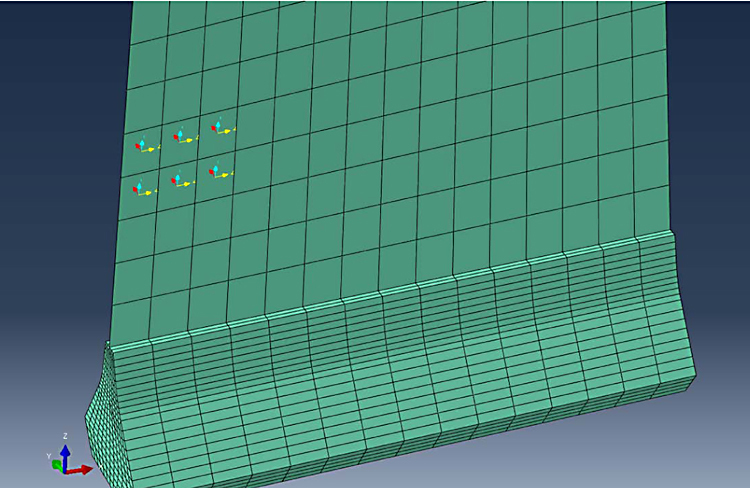 Geometry, material data and proposed methodology are given in this section. The fan blade-like structure used for this work is shown in Figs. (1a and 1b ). The root has been modelled with linear HEX elements. The same element type has been used when modelling the pads in contact with the root flanks, mimicking a fan blade disc. It is quite important to model the contact as the tip extension of a fan blade and in general, its deformation is also a function of the amount of slip between the contact pads (representative of a fan blade disc) and the root. The aerofoil has been modelled with QUAD shell elements. Abaqus [14"SIMULIA ABAQUS 6.14-5", Dassault Systèmes., Providence, RI, USA, 2014.] “Surface to Surface” contact option has been chosen with a friction coefficient of 0.08. In order to guarantee a good and detailed discretisation, the blade has been divided into 50 regions (each region is a square composed of 9 shell elements) as shown in Fig. (2 ). The second step of the optimization takes into account the ply-drop of the laminate so it can potentially reduce the length and/or the width of each ply starting from the minimum “Unit” size of 1/10 of the full length of the airfoil and 1/5 of the full width of the airfoil. Each unitary length region (each of these 50 regions) has 9 elements in order to obtain a good value of stress and displacements. The number of regions can obviously be further increased, but this number is enough to test the proposed optimisation method. In order to test the optimisation procedure of a realistic stacking sequence that also could be easily manufactured, the same stacking sequence and the same thickness were assigned to each of these 50 regions. Finite elements model of the fan blade-like structure used for the optimisation. Detail of the pad (simulating the disc) and the blade. 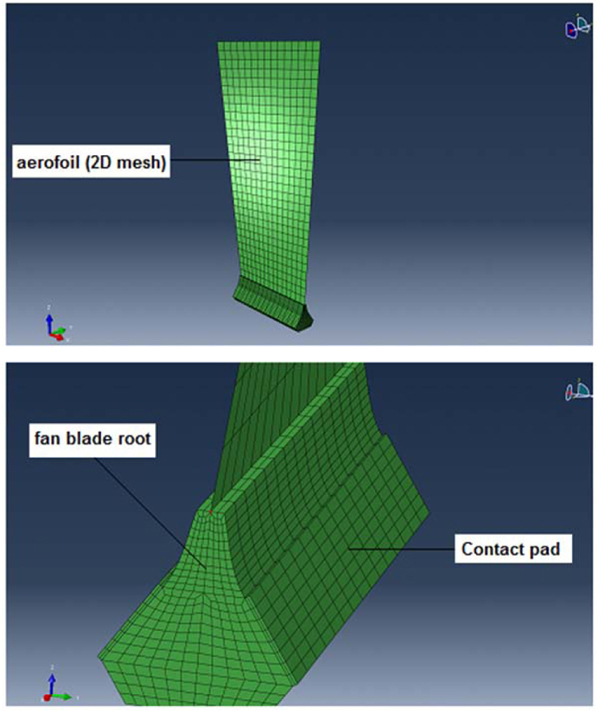 A standard surface to surface Abaqus contact has been defined at the interface (shared contact surface) between these three components (two pads and the fan blade root flanks). The friction coefficient is 0.08. Sub-division of the fan blade-like structure for the optimisation exercise. A 2 mm titanium sheet has been added (both to the pressure and to suction side) to the elements of the leading edge region. The thickness of this titanium layer is not considered as a variable of the optimisation. The stacking sequence of each region is symmetric and has a maximum of 52 layers (each layer is 0.15 mm thick). A local orientation has been assigned to each of the 50 different regions. Fig. 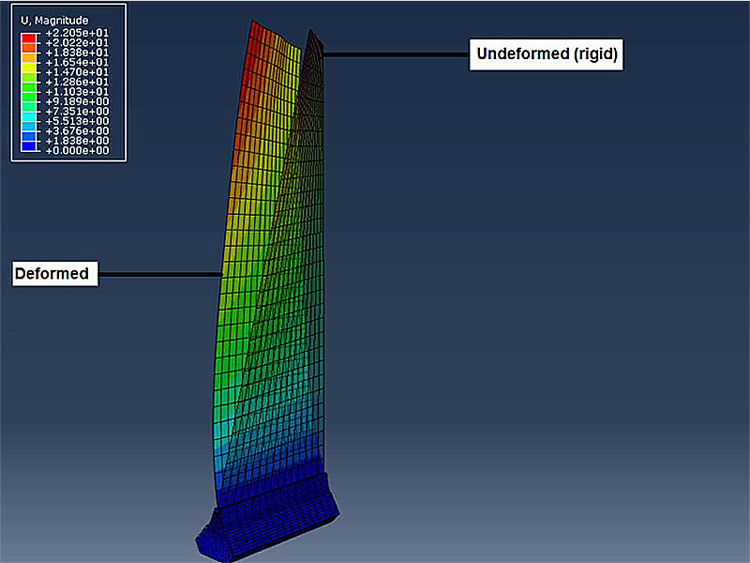 (3 ) shows an example of the material orientation given to the regions of the blade using the Abaqus “Discrete Orientation” option [14"SIMULIA ABAQUS 6.14-5", Dassault Systèmes., Providence, RI, USA, 2014.]. Example of orientation assignment of the shell elements. 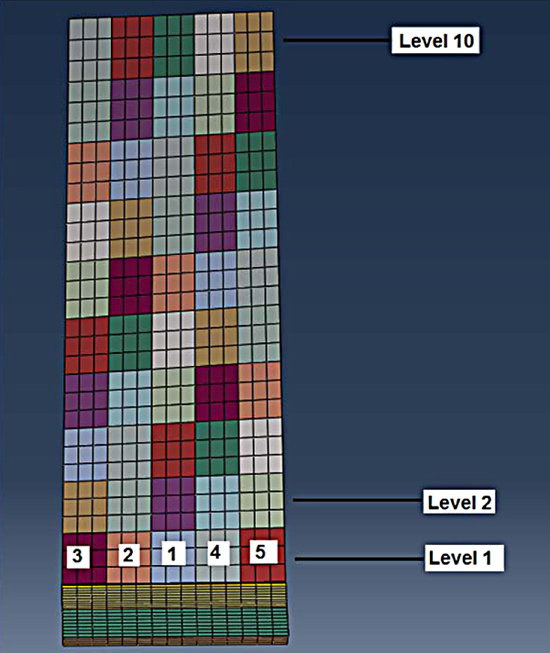 The Abaqus laminator has been used to assign the stacking sequence as shown in Fig. (4 ). Assigning a stacking sequence (right) to a representative leading edge element (red on the left hand side of this Figure). Height (H): 775 mm (700 mm aerofoil directly connected to a 75 mm root). Distance between the base of the root and the rotation axis (d): 250 mm. Undeformed tip twist angle α = 30°. No transition area between the root and the aerofoil has been included in the model. A rotational speed of ω = 340 rad/s (ca 3247 rpm) has been applied resulting in a centrifugal load. The 2D material properties (carbon/epoxy) used for the single unidirectional layer used for building the stacking sequence are given in Table 1. Unidirectional composite layer material properties. The “Smeared Material Properties (an orthotropic 3D laminate material defined by 9 engineering constants and a density value)” of the Composite, used to model only the root region are given in Table 2. “Smeared properties” of the composite material used to model the root. Material properties of the titanium layer. First natural frequency between 40 and 50 Hz. Second natural frequency between 100 and 130 Hz. The tip extension movement (contact slip plus blade deformation) must not exceed 2.5 mm. The angle of untwist (defined as the twist angle of the tip cross section) must be less than 3°. Strain threshold must be respected. Two different sets are given. For aerofoil elements representing the bare composite, thresholds are: εc1 = 0.0058, εc2 = 0.0058, εc12 = 0.0035. Thresholds for leading edge elements with titanium coatings are: εle1 = 0.0038, εle2 = 0.0038, εle12 = 0.0023. Other constraints such like manufacturing best practices of stacking sequence could eventually be easily introduced in the optimisation. However, the main focus of this work is the introduction of a 2 step optimisation with ply blending in order to minimise weight. Simulia Isight [15"SIMULIA ISIGHT 5.6", Dassault Systemes, Providence, RI, USA, 2011.] has been used as an optimiser. Genetic Algorithm (GA) has been chosen as preferred optimiser as already proven effective when dealing with discrete variable values [16F-X. Irisarri, D.H. Bassir, N. Carrere, and J-F. Maire, "Multiobjective stacking sequence optimization for laminated composite structures", Compos. Sci. Technol., vol. 69, no. 7–8, pp. 983-990. [http://dx.doi.org/10.1016/j.compscitech.2009.01.011] , 17H. An, S. Chen, and H. Huang, "Simultaneous optimization of stacking sequences and sizing with two-level approximations and a genetic algorithm", Compos. Struct., vol. 123, pp. 180-189. [http://dx.doi.org/10.1016/j.compstruct.2014.12.041] ]. Isight optimiser interacts with only one Matlab [18"Matlab R2013a", The MathWorks Inc., Natick, Massachusetts, United States., 2013.] block. Such a Matlab block (an M - File) processes the inputs (the stacking sequence of each aerofoil section), produces and runs an Abaqus input deck, post-processes the .odb file by calling some Python scripts to extract frequencies, displacements and stress values. After deleting all the files produced by one analysis, the M-File returns the output values: aerofoil weight, tip extension, untwist, number of elements failing the strain threshold criteria and natural frequencies (Fig. 5 ). Isight/Matlab interaction during the optimisation loop. The optimizer selects the design variables. Matlab then runs the simulation tools calling Abaqus and postprocessing the results. The output is given then back to the optimizer for evaluation. As already remarked in the introduction, when running an optimisation, in order to avoid unrealistic results, manufacturing constraints are to be included [19D.M.J. Peeters, S. Hesse, and M.M. Abdalla, "Stacking sequence optimisation of variable stiffness laminates with manufacturing constraints", Compos. Struct., vol. 125, pp. 596-604. [http://dx.doi.org/10.1016/j.compstruct.2015.02.044] -21J.M.J.F. van Campen, C. Kassapoglou, and Z. Gürdal, "Generating realistic laminate fiber angle distributions for optimal variable stiffness laminates", Compos., Part B Eng., vol. 43, no. 2, pp. 354-360. [http://dx.doi.org/10.1016/j.compositesb.2011.10.014] ]. A two-level optimisation strategy has been therefore implemented. No more than 5 elements failing the strain criteria. Angle of untwist between -4 and 0 degrees. Variables of the optimisation step are 26 plies angles that may potentially assume four discrete values. In other words, the first step of the optimisation allows finding an optimum in terms of stiffness, with slightly more relaxed constraints. The second level of the optimisation, which has the aim of minimising the weight satisfying the original intent and not the “relaxed” constraints of step 1, concerns the “ply drops”, i.e. the blending/tapering of the stacking sequence. The layers are terminated in a specific location (unknown) of the aerofoil in order to produce a realistic blade satisfying manufacturing constraints. Each ply of the stacking sequence found after the first step of the optimisation has a variable length (from 1/10 to 10/10 of the length of the aerofoil) and a variable width (from 1/5 to 5/5 of the width of the aerofoil). Each ply will always have its base at the top of the root, the very bottom region of the aerofoil. An illustration is given in Fig. (6 ), where the width and the length of ply 1 and ply 2 are a variable of the optimisation. Length and width of each ply as a variable of the second step of the optimisation. Ply length: i*H/10, with i = 1, 2…10 (only integer values). Ply width: j*W/5, with j = 1, 2…5 (only integer values). If a ply width j = 1 is found, the lamina will be placed at the central area between leading and trailing edge. If j = 2 or j = 3 is selected by the optimiser, the ply position will extend from area 1 to the discrete zones towards the leading edge of the airfoil (Fig. 7 ). A lamina having a value of j = 5 will occupy the entire width of the ith section of the blade (lengthwise). Zoning the fan blade for optimising the width and length of each ply. Standard Isight GA [15"SIMULIA ISIGHT 5.6", Dassault Systemes, Providence, RI, USA, 2011.] has been used for all the simulations presented in this paper. The GA is a multi-island one and it is based on the concept of evolution [22S. Nagendra, R.T. Haftka, and Z. Gürdal, "Genetic Algorithms for the Design of Composite Panels", Advanced Technology for Design and Fabrication of Composite Materials and Structures., Springer Netherlands: Dordrecht, pp. 129-143. [http://dx.doi.org/10.1007/978-94-015-8563-7_10] ]. The best individuals of a generation have a better probability of producing a better generation in terms of fitness function and constraints. Each individual is evaluated with a dedicated simulation. The numerical results are presented in this section. Each analysis of the optimisation takes about 240 seconds to be completed by using a HP Z800 workstation (Quad-Core Intel Xeon Processor 5500 Series with Intel 64 Architecture: Intel Xeon X5570, 2.93 GHz, 8 MB cache, 1333 MHz Memory, 6.4 GT/s QPI, 95W. Intel Xeon X5560, 2.80 GHz, 8 MB cache, 1333 MHz Memory, 6.4 GT/s QPI, 95W). The best stacking sequence of the entire simulation is given in Table 4. The orientation of only 26 plies was reported considering the assumed hypothesis of symmetry stacking sequence for the aerofoil. Performance results of the “Optimum” stacking sequence found. It is interesting to remark that the stacking sequence found has the same percentage of -45 and +45 fibres. In other words, no anisotropy is beneficial for this kind of loading condition. The weight has not varied at the end of this first step of optimisation. It is important to remark that it has been imposed that no ply could be terminated at the bottom section of the aerofoil. Final results of the optimisation are given in Table 6. “Optimum” stacking sequence after the second optimisation step. Only half a laminate (26 layers) is shown as symmetry is imposed. The final deformed shape of the optimised blade is shown in Fig. (8 ). The final deformed shape (static) of the optimised blade. As it can clearly be seen from the results of the “Optimised” structure, no anisotropy such as extension-bending coupling or bend-twist coupling is exploited. This is mainly due, in author’s opinion, to the load (centrifugal force only) applied to the model. The centrifugal force alone, given the initial twisted plate geometry, is such to guarantee the presence of a good amount of “untwist” in the deformed structure, like measured in the metallic/isotropic fan blades. A gas map (aerodynamic loads) may, on the other end, induce bending in the deformation of the structure. For more complex loading than the one applied in our study case, therefore, anisotropic effects such as bend-twist coupling may be beneficial. This will be investigated as a part of the future work. In order to verify the solution found, a series or random analyses have been performed in the design space near the optimum point. No better solution has been found such to satisfy all the constraints or even to converge (non-linear static simulation with Abaqus). As an example, the results of two blades having the same thickness distribution of the “optimum” solution but two different stacking sequences are given in Tables 8 and 9. “Blade QI” has a quasi-isotropic stacking sequence (same percentage of 0, +45, -45 and 90 degrees plies). Blade Zero has about 90% of 0 degrees plies and about 10% of 90 degrees plies. Both “Blade QI” and “Blade Zero” fail to meet the required constraints. Performance results of the “Blade QI”. Performance results of the “Blade Zero”. This procedure is far from claiming an “Optimum” in the mathematical sense. However, the design space is explored in such a way to find a good design solution. Furthermore, the use of a simplified model is useful to understand trends to be potentially exploited in more complex high fidelity models. A level 1 optimisation is defined with the aim of maximising the stiffness (a specific deformation such like tip extension is minimised in this example) in order to select a unique stacking sequence (plies having the same length and width) along the fan blade-like structure. A second level optimisation is defined in such a way to minimise the weight of the structure by selecting the ply drops terminations of the stacking sequence found in step 1 of the optimisation. The ply drops are found by selecting as design variables the width and the length of each ply along the two dimensions of the airfoil. The structural model has been loaded only with a centrifugal force (rotational speed) in order to prove the procedure. More controls on the geometric deformation (control points on the pressure and suction side for example) of the structure could be added in order to reach a better aero-performance. Controlling only tip extension and angle of untwist is definitely not suitable for a more complex structure such as a real fan blade. As a part of the future work, it would be interesting to try the proposed method by adding a gas map (static aeroelastic equilibrium). In that case, the effect of anisotropy given by unbalanced laminates could be beneficial. The authors declare no conflict of interest, financial or otherwise. M.J. Robert, Mechanics of Composite Materials, 2nd revise.Taylor & Francis Inc: Washington, United States, .2nd revise. S. Abrate, Impact on Composite Structures., Revised ed.Cambridge university press: Cambridge, United Kingdom, .Revised ed. M. Thomas, P.M. Weaver, and S. Hallett, "Variable stiffness composite laminates for rotating pre-twisted plates", the 17th European Conference on Composite Materials, ECCM, 17th, . R.M. Coroneos, "Structural analysis and optimisation of a composite fan blade for future aircraft engine - NASA/TM—2012-217632", Glenn Research Center, Cleveland, Ohio, 2012. "SIMULIA ABAQUS 6.14-5", Dassault Systèmes., Providence, RI, USA, 2014. "SIMULIA ISIGHT 5.6", Dassault Systemes, Providence, RI, USA, 2011. "Matlab R2013a", The MathWorks Inc., Natick, Massachusetts, United States., 2013.